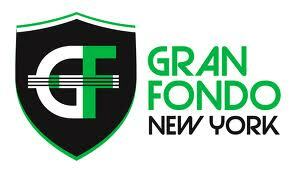 Last Sunday I rode in the inaugural Gran Fondo New York. The Gran Fondo is a "popular cycling event stemming from Italy. With a peloton of 500 to 10,000 participants, a Gran Fondo covers at least 100 miles and goes over challenging terrain. In France and the UK such events are known as cyclosportives." For the first New York version two flavors were offered: the Gran Fondo at 100 miles with 6600ft of climbing or the Medio Fondo at 65 miles with 3668ft of climbing. I chose to do the medio since my training really doesn't need a hundo (yet) even though my "friend" DrFran kept asking me to consider doing the whole enchilada that he was doing as part of IMLP training. I luckily declined. This ride was expensive. They included a jersey that was required to be worn to take advantage of the ride support. The start wasn't all that convenient as it started at 7AM on the bottom of the George Washington Bridge so I had to get up in the dark to find free parking (I did!). When I got there and looked around at the few thousand people lined up I noticed that there were very few women riders and a preponderance of hammerheads. There seemed no cheap bikes. George Hincapie showed to ride but didn't wear the "official" jersey. I wonder if he got a banana at the rest stop wearing his BMC kit. It seemed like a lot of people we racing this ride. The announcer advised not to race until after the first 5 miles to let the crowd thin out. Before the start they had someone sing the anthem. I noticed early on that she seemed to be moving the words around but near the end of the song, it seemed very free form and I thought she was making up her own words. I thought I was the only one that noticed but I saw a bunch of people start making up their own words to the anthem too and laughing. This ride was hard. It was crowded in the beginning. The organizers controlled traffic well (most streets were patrolled by members of the law enforcement community). There were lots of climbs and it was definitely harder than I thought it would be. It covered many of the "standard" NYC rides with a little bit of extra hillage thrown in. At the end of this ride I was hurting more than after a 70.3 due to all the climbing (Fran's Garmin said the hundo had over 10k ft of climbing). I just wanted it to be over. Unfortunately the finish line was in New Jersey and my car was in New York so I had to ride an additional 4 miles over the George Washington Bridge to get back. That extra climbing was really annoying as I was already spent. This ride is definitely on the future Rock Star calendar especially if they move it from Mothers Day as promised. Maybe even the hundo. PS: My friend Mikey called me yesterday and asked how I could get out to ride a long ride on Mother's Day. I answered that my wife, the mother of my children, is a special person, she endorsed this training day and let me gallivant around that morning. Another example of how lucky I am. They have a few fondo rides here, including one with a really cool jersy, but like you said...pricey. I'm jealous of your understanding wife. My fondest wish for mother's day was a run or ride, but instead I was spending "quality time" with my family. Sounds like a fun, but challenging day for sure. 10k of climb? wow, I didn't think you could find that much elevation without hitting the mountains - nice work! That sounds really scary that your car was in a whole 'nother state!! Good for you on finishing it up and aspiring to do it again next year. Nice job on the ride. Sucky that they scheduled it for mother's day, but at least you have the support.